For the next three weeks, Many of America’s top sling shooters will be at Camp Perry, Ohio competing at the National Matches. The Smallbore 3P Event commences today, July 17th, with more rimfire matches over the next few days. Following the smallbore events, centerfire HP and vintage rifle events run all the way through August 8, 2018. That means there will be a LOT of sling shooting going on for the next three weeks at Camp Perry. If you want to learn more about setting up your sling properly for position shooting, here are some tips from Dennis DeMille, a past Service Rifle Champion. SFC Brandon Green, 2018 Nat’l High Power Champion. Brandon, one of the nation’s best “hard-holders”, demonstrates proper use of sling in prone position. Share the post "The Sling’s the Thing — Tips on Sling Use by Dennis DeMille"
In a great individual performance, Kevan Hoffarth, shooting a Palma Rifle, shot clean to beat ALL sling shooters, including those in the “Any Rifle” sub-class. In fact, “Any” shooters took the next four sling places. In the F-Open Division, it was a very tight race, decided by X-Count for the top five places, with Dan Bramley edging Robert Hoppe for the win by one X. When folks usually talk about shooting matches they focus on the obvious — scores and hardware. But the Berger Southwest Nationals (SWN) is about much more than putting holes in paper with bangsticks. We’d say this match has become so popular (with 400 entrants) because it offers the whole experience — fun, challenge, a warm-weather escape, and above all, camaraderie. Some shooters come to Ben Avery for the swag (the prize table is amazing). Others come for the sunshine (think warm 75-85° weather). And even more folks come to try out their shiny new toys and to test their skills against the nation’s best shooters. But we’d say the number one reason most folks make the pilgrimage to Ben Avery every year is the camaraderie — the chance to connect with friends, rekindling connections that may go back decades. Fundamentally, then, the Berger SWN is about the people. For this Editor, the chance to meet good friends such as John Whidden, Gary Eliseo, Doan Trevor, Nancy Tompkins, Anette Wachter, Shiraz Balolia, Adam Braverman, Jay Christopherson, Erik Cortina, Scott Harris, and so many others, gives me plenty of motivation to make the 7-hour drive from California. For many of us, this is the only time of the year when we get a chance to meet fellow shooters from distant corners of the USA. And where else will you find a past NRA President (John Sigler) on the firing line, and have a chance to chat with him during a lunch break. The SWN is very special. The best minds of the shooting world come to Ben Avery every year. Got a question about ballistics? Well, Ballistics Guru Bryan Litz will be happy to answer your questions between relays. Want some expert advice about wind reading? Seek out Mid Tompkins (usually found hanging around the club-house) or Emil Praslick, one of the most knowledgeable wind coaches on the planet (Emil was shooting and coaching this year). And if you have a gunsmithing question, you’ll find some of the top barrel-fitters and stock makers, including Doan Trevor and Gary Eliseo. If you want to test your mettle against some of the best shooters in the world, get yourself to Ben Avery in February. Here you can compete, shoulder to shoulder, against the best Sling and F-Class shooters on the planet. Guys like John Whidden (reigning Long Range National Champion) and Kenny Adams (reigning World F-Open Class Champion). If you want to play with the “Big Boys”, Ben Avery is the place. Having said that, novice shooters will enjoy the experience as well, because you’ll find that these top shooters are (almost universally) happy to share their knowledge. If you want to improve your game, this is the place. Walk down the firing line and you’ll stand shoulder to shoulder with many national champions. There is no question that you can improve your techniques by watching top shooters, and you can get ideas about hardware by looking at the rigs campaigned by the best. Where else will you find a half-dozen national F-Class champs seated around a table. Or an 11-time National High Power Champion (David Tubb), hanging out at the Lapua trailer in the parking lot. If you are thinking about upgrading your match rifle, you’ll find plenty of inspiration at Ben Avery. On the firing line you’ll fine the newest actions from Barnard, BAT, and Borden, the latest/greatest optics (see Vortex Golden Eagle below), and the newest most advanced stocks. F-TR guys will find a wide variety of exotic bipods plus the latest generation of sandwich-construction bipod “mats”. (NOTE: These are becoming rigid, elevated platforms with low-friction tops — will the rules be tightened?). When we arrived in Phoenix on Tuesday it was a relatively mild 76°. By Friday it had warmed to a balmy 84°. We didn’t hear any complaints from the Canadians who fled ice and snow to shoot the match. Even while California was getting soaked with rain it was sunny and warm in Arizona. And you can even have a balloon ride right over the Ben Avery range. The Ben Avery Shooting Facility is located in a scenic corner of Arizona, north of Phoenix. Get here early in the morning and watch the balloons take off. Head northwest and you can visit the historic town of Prescott. Two hours north is Sedona, famed for its stunning Red Rock scenery. A few hours south you can visit Tombstone and the OK Corral. There’s a lot to see and do in the Phoenix area that makes the trip worthwhile in addition to the gun fun at the range. Share the post "Berger SW Nationals — Day 4 Report from Saturday"
Photo shows Precision Rifle Sling from Armageddon Gear. A good sling is a vital accessory for a hunting or tactical rifle. Along with enabling over-the-shoulder carry, a good “tactical” sling will also provide support for shooting from hasty or improvised shooting positions. In fact, in many tactical/practical precision matches there will be at least one positional shooting stage or a stage where only a sling may be used for support (that means no bipod, no tripod, no sandbags, and no shooting sticks). The 6.5 Guys, Ed and Steve, recommend tactical slings that allow quick set-up and easy adjustment. The best slings allow shooters to quickly slip into them and then make rapid fine-tuning adjustments to build a stable shooting position. In this episode, Ed and Steve provide an overview and compare/contrast different designs and the functionality of six popular slings from these suppliers: Armageddon Gear, Tab Gear, Rifles Only, Hard Target Interdiction, Short Action Precision, and Accuracy International. To learn more about tactical/practical shooting disciplines, or to access more shooting gear/accessories reviews by Ed and Steve, visit 65guys.com and subscribe to the 6.5 Guys’ YouTube Channel. Video Tip from Boyd Allen. We welcome reader submissions. Share the post "Tac Talk: Six Tactical Slings Reviewed by 6.5 Guys"
Read 2016 Sierra Cup Match Comments in the AccurateShooter Forum. Two Sierra staffers competed this year, shooting prototype Sierra bullets in the final stages of testing. Congrats to Sierra’s Tommy Todd who took Second Place in F-TR class, and to Sierra’s Mark Walker who finished third in F-Open. That bodes well for the new, experimental Sierra bullets. Based on Tommy’s and Mark’s results, the new Sierra bullets appear to be very accurate indeed. “This was my first time at BRRC and it was as anticipated — a great place to shoot. I met many gracious and talented shooters. I love getting to try new ranges and meeting people from the AccurateShooter Forum. It’s fair to say that even the guy from North Dakota was chilled when we started on Saturday. The warm welcome helped take the edge off. Organizing a match of this caliber takes a lot of work even with an army of people behind the scenes, and without a core group herding the cats it doesn’t run well as this one did. Thanks Brett, Joe, and everyone who made this match run so smoothly. Coordinating with sling, bench, F-TR and F-Open shooters’ needs must have been remarkably challenging and you made it look effortless. It was a fun time. I can highly recommend this range and this match to everyone wanting an enjoyable and memorable experience. Conditions on Saturday were definitely not a trigger-pulling contest, and (for me) that adds to the fun. The amenities are top tier. Many of the ranges I shoot at do not even have running water, much less showers onsite. Thanks to Sierra for the sponsorship and very generous prize table. And thanks for the award waiving my entry fee as the ‘Long Distance Shooter’ for my trek. That was classy and completely unexpected.” — Drew R.
Share the post "2016 Sierra Cup — Multi-Discipline Fun in St. Louis"
This video includes interviews with Walt Berger and tube-gun builder Gary Elesio. This is our final Berger SW Nationals video for 2016, so enjoy the highlights from Ben Avery — see you next year. The 2016 Berger Southwest Nationals are now history. This was a great match, with an incredible level of talent. There were numerous “big names” on the line, including reigning F-Open World Champion Kenny Adams, 10-time National High Power Champion Carl Bernosky, past National Long-range Champion John Whidden, current National Mid- and Long-Range F-TR Champion Bryan Litz, and Derek Rodgers, who won the F-TR division at last year’s SW Nationals. With a strong performance this week, Derek topped the F-TR field again, securing his second straight SW Nationals F-TR title. In team competition, the Michigan F-TR Team scored a narrow victory over tough competition from the USA F-TR Team and the X-Men. In the F-Open Division, Team Lapua-Brux shot superbly at 1000 yards to capture the Aggregate title, finishing ahead of Team Grizzly and Team Berger. The Ethnic Fringe Team from the UK had strong performances in the Sling Division Team events. With his 2016 victory, Derek Rodgers has secured back-to-back F-TR titles at the Berger Southwest Nationals. He says he likes his new McMillan F-TR stock. View yesterday’s feature video for a revealing interview with Derek. In that video, Derek discusses the best bullet and powder choices for F-TR. Members of the winning Lapua-Brux F-Open team were all smiles. They deserved to be proud — they set a new SWN record in the 1000-yard team match. Left to right: Bob Sebold, Pat Scully, Erik Cortina, Steve Harp. Here is F-Open Winner John Myers of Texas, along with Berger’s F-Open Perpetual Trophy. John is interviewed in today’s video, linked at the top of this story. John’s F-Open rifle is chambered for the 7mm Walker, a .284 Win Improved similar to the .284 Shehane. Share the post "Berger Southwest Nationals — Match Wrap-Up"
Here’s a cleverly-designed new product that adds versatility to any rifle with a front sling swivel stud. This new Stud Rail Adapter (SRA) allows you to mount a Picatinny Rail on a sling swivel stud. With the SRA in place, you can attach any accessories that clamp to a Pic rail, such as lights, lasers, pistol grips, or rail-affixed tactical bipods. And look carefully — the SRA’s designers included a sling swivel at the inboard end of the unit. That way you can mount Picatinny-rail accessories and still use your carry sling. Sold by Harrisbipods.com, the SRA Stud Rail Adapter retails for $47.85. NOTE: HarrisBipods.com is a web retailer. This is NOT Harris Engineering, the manufacturer of Harris bipods. HarrisBipods.com does sell the full line of Harris bipods and most Harris accessories. However, as far as we can tell the SRA is NOT made by Harris Engineering. Comment: We think this adapter is a useful invention, particularly for those who might want to mount a light to a varmint rifle. Most hunting rifles have a front sling swivel stud and there is now a very wide selection of Picatinny-rail-mounted accessories. Share the post "Stud Rail Adapter Mounts Picatinny Rail on Sling Swivel Stud"
In this article, I’ll share what works for me in the prone shooting game. However, I recognize that every shooter/rifle combination is unique. So, the best way to find out what will really work best is by practicing and putting some rounds down range. But hopefully you’ll find some suggestions in this story that prove helpful. I keep my sling high on the pulse pad of my Creedmoor Sports shooting jacket which turns out to be at the top of my bicep muscle. The sling is tight enough that, with my forward hand against the hand stop and the stock firmly in my shoulder, the rifle is fully supported without any noticeable muscle use. As my coaches have recommended, placing my forward elbow as close to directly under the rifle as possible often yields a more stable position. My trigger hand does not support the rifle but rather grips it without disturbing its aim. If the rifle can be held level and stable with just the forward hand and sling, then one knows a good prone position has been found. As with shooting off hand, when shooting prone, I find it best to keep my head as close to perfectly vertical as possible. While swaying is not a typical problem in the prone position, if a vertical head position grants me more stability, I will work to have one. My torso in particular bends in a way that may be uncomfortable for other prone shooters. My left hip and some of the left side of my stomach touch the ground but the majority of my chest and diaphragm are off the ground while I shoot prone. By minimizing the contact my stomach and chest have with the ground I can also minimize the effect my breathing has on my hold. (Also breathing is much easier when each breath isn’t lifting one’s torso weight). Below my waist my left leg extends almost perfectly straight out and sometimes falls asleep while shooting. My right leg is cocked and my right knee is brought up almost even with my right hip. This is what allows me to get so much of my torso off the ground. In the prone shooting game we shoot at distances from 300 to 1000 yards using iron sights (and sometimes scopes). When I have a good prone position, and my breathing is correct, there are a few seconds right before I take a shot when I feel as if my rifle is being supported on a bench. This sort of stability is only needed for the few seconds it takes to squeeze the trigger. It can, however, very consistently produce sub-minute groups with iron sights from the prone position at any range from 100-1000 yards. Share the post "Body and rifle positioning for prone shooting"
Along with the sling-shooters, F-Class competitors test their skills this weekend in Ottawa. Alexander Tklitch shot a 75-7V to lead the F-Open Division, while Kevin Chou	posted a 74-10V to top the F/F field by two Vs. Why are we referring to “Vs” rather than “Xs”? In international competition, the “V” area is the center-zone equivalent to our X-Ring in the USA. However, the Scoring Ring values are different. On International fullbore and F-Class targets, the highest scoring ring has a value of 5, not 10 as in the USA. So, a 75 score represents the max points possible for 15 shots. If all those shots land in the V zone, the total, for 15 shots, would be 75-15V. Story Based on report from NRAblog.com. Share the post "Wandering Shooting Tribes Head to Ottawa, Ontario"
The Remington-Bushmaster 2012 Long Range Regional Championship was held at Reade Range in Fallen Timbers, Pennsylvania on June 1, 2, and 3. We had a great turn out of over 60 shooters. Half of these shooters showed up on Friday to participate in the practice and team match. The weather had other plans for the shooters though and the second half of the team match was rained out. Saturday started off sunny, but cool and windy, with 62 shooters registering in Sling (43), F-TR (7) and F-Open (12). Pit service was provided by the Boy Scouts, and had a rocky start. With the help of some shooter volunteers, pit operations smoothed out throughout the day and the first three 1000-yard Matches ran without incident. The wind pretty much held a steady 2 MOA left throughout the day, and some high scores were fired. After the Saturday matches were finished and daily scores posted, Bryan Litz conducted a wind clinic, and then the Reade Range Staff provided a wonderful meal of ca-bobs, salads, fresh fruit and beverages. Then came the prize raffle. Over 50 prizes were raffled off, including a Vortex Spotting Scope, gift certificates, and other merchandise items worth over $6000. Sunday morning started off overcast and the same wind as the day before. Conditions remained constant and the pits ran smoother than ever with more volunteers helping the scout troops. Rain was forecasted to start at 3:00 pm so the shooters were eager to move through the matches and beat the rain. Mission accomplished, as a cease fire was called just before 3:00 pm, ending the last match. Scores were quickly figured and awards were promptly given. Bryan Litz, of Applied Ballistics LLC, announced the winners of each individual match, Tom Ferraro announced the aggregate match winners, and finally Ken Roxburgh presented the winners with guns on behalf of Remington-Bushmaster. The rain showed up as the final name was announced. 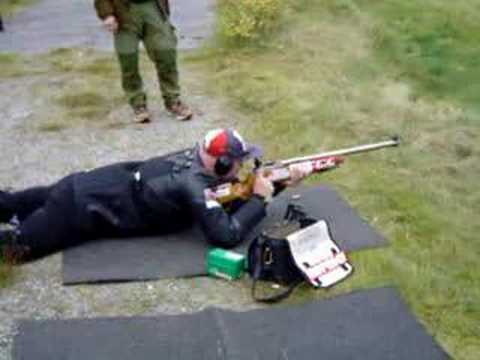 Share the post "Remington-Bushmaster 2012 Long Range Regional Championship"
Our recent post about Norway’s annual Landsskytterstevnet (Rifle Country Fair) marksmanship competition was very popular. American sling-shooters noticed how Norway’s marksmen used a different sling set-up and how the Norwegians were using their middle finger or ring finger to pull the trigger. This allows faster cycling of the bolt in rapid-fire competition. Unfortunately, some of our readers with slower internet connections were not able to stream the video from the Norwegian server. Here are two YouTube videos posted by reader ICECOOL from Norway. The first shows John O. Ågotnes shooting rapidfire in the Stangskyting discipline (25-second time limit). The gun is a Sauer 200 STR (Scandinavian Target Rifle) chambered in 6.5×55. The second video, below, shows competitors in a 3-position (standing, kneeling, prone) shooting competition at the 2008 Samlagsskyting Finals. This provides good closeups of the Norsk sling arrangement. Note also the electronic scoring technology which instantly plots the shots on the target. This makes it exciting to watch the match… tension builds until the final shot. American clubs could benefit from electronic scoring which allows the crowd to follow the action. ICECOOL has posted more links to Norway shooting match videos on the Firing Line Forum. Many of these matches are actually broadcast live, in prime-time, by Norwegian Television. Share the post "More Interesting Shooting Competitions from Norway"
Looking for a sturdy, versatile shoulder/sling bag that doesn’t look like a “metrosexual” man-purse? Check out the Rapid Deployment Pack (RPD) from Natchez. Sturdily made from heavy-duty nylon with beefy fasteners and a quick-release front buckle, the RPD offers plenty of storage in a 10″ H x 12″ W x 3″ D format. On the front the RPD has velcro-secured mag pockets which can also be used for hand-held radios, wind meters or other gear. While other companies offer similar bags for up to $120.00, the RPD retails for $26.99. That’s a lot less than most sling bags cost. This editor personally likes this bag (made by U.S. Peacekeepers) because it will hold a 10″ netbook (and paper notepads) in the main compartment, while I can put my still camera and video camera in the mag pockets. The $81.00 Maxpedition “Jumbo”, while otherwise a good bag, is a bit too small to carry a netbook easily in the main compartment. The RPD has the carrying capacity I need for assignment work, without being too large. In the field the RPD can easily carry your wind meter, laser rangefinder, log book, spare mag, and water bottle, making this a useful option for tactical comps. The RPD offers serious utility for half the price of the Maxpedition Jumbo. Share the post "Versatile $40.00 Sling Bag Holds Lots of Gear"
Germany’s Vero Vellini has released a new double-strap sling system that holds your rifle securely, while allowing you to keep both hands free while hiking or stalking game. Vero Vellini’s new “High Climbing Double Sling” is modeled after the Biathlon rifle slings used in the Winter Olympics. If you have ever tried a Biathlon-type sling you know it is far superior to a conventional over-one-shoulder sling, when you need to run, climb, or to move rapidly from one shooting position to another. We predict this double sling will become popular with alpine hunters and tactical/practical rifle shooters who must move rapidly through a multi-stage back-country course. As with a conventional sling, the new double sling can be used to steady your shot. By looping the sling behind the elbows, you’ll get better support when taking an off-hand shot. The fully-adjustable “High Climbing Double Sling” comes in Forrest Green with Dark Brown trim. The product is very nicely made — the “air cushion” neoprene shoulder straps have stout leather end panels and the webbing and snap-buckles are top quality. The “High Climbing Double Sling”, item V17350, retails for $89.99. To order, contact Vero Vellini’s USA dealer, Pioneer Research, (800) 257-7742. Vero Vellini also manufactures fast-access cartridge cases, scope covers, and straps for binoculars and cameras. Share the post "Double Rifle Sling for Hunters and Tactical Shooters"
On the ShootingUSA television show, today’s episode will feature the Infantry Team Match at Camp Perry. In connection with that segment, Sgt. First Class Kyle Ward of the U.S. Army Marksmanship provides guideslines on how to properly fit a shooting sling, and how to best use the sling in various shooting positions. CLICK HERE to read Sgt. Ward’s step by step Sling Instructions. Once the sling is linked together properly, Sgt. Ward explains: “The next step is attaching the sling to your arm. Attaching the sling to your arm is simply done by creating slack in the sling, turning the sling a quarter turn clockwise if you’re a right handed shooter, or a quarter turn counter clockwise if you’re a lefty. You know that your sling is set to the proper length when you can easily and comfortably get into position, when you can take your firing hand off the rifle, and the rifle remains in your shoulder. To get the most of your sling, setting it to its proper length, and where you place it on your arm is critical. There are some general rules to follow when setting up your sling. You want it tight enough that it’s providing maximum support, but not so tight that you have to fight to get it into position. Sling placement on your arm is also critical. In the sitting position, you want to place the sling toward the inside of the arm. Place the sling too far to the outside, and it will likely introduce pulse into your position. It’s not uncommon to have to adjust the length of the sling for different firing positions. While using the sling in the prone position, you should place the sling in the outside of the arm. Placing the sling too far towards the inside will reduce the sling’s effectiveness and likely generate pulse. Share the post "USAMU Tips on Sling Use"